We don’t want to see you hurt, but if it happens we can help. 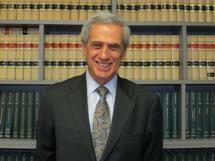 JACK S. PIERMONT, a member of the firm, was admitted to the New Jersey Bar in December, 1973. From February to May, 1974 he served as an assistant Judge Advocate at Plattsburgh Air Force Base handling administrative matters, disciplinary hearings and court martials. Jack joined Frank Lerner, P.A. in May, 1974 and became a partner in 1981. Jack has vast trial experience in civil, criminal, quasi-criminal, family and chancery matters in the Superior Court of New Jersey and United States Federal District Court. He has handled administrative hearings before such state agencies as PERS, Social Security Administration and the Division of Motor Vehicles. He appears frequently in the Workers' Compensation Courts and the Superior Court, Law and Appellate Divisions for various matters. He served the American Arbitration Association as a panel arbitrator and as a Court appointed Arbitrator in Superior Court. Jack is also approved as a real estate closing attorney for various title companies in New Jersey and is a member of the New Jersey and New York Bars as well as the American, New Jersey and Hudson County Bar Associations. Lerner, Piermont & Riverol, P.A., represents clients in Jersey City and the surrounding communities throughout Hudson County and the state of New Jersey.